Expected ship date 05/13/2019 Estimated lead times do not include weekends or holidays. Transit time is determined by shipping method and destination. Orders requiring credit information might take additional time. 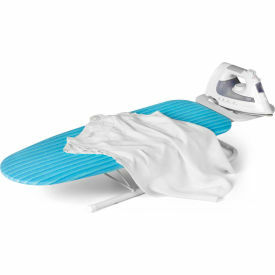 Honey-Can-Do BRD-01294 Deluxe Tabletop Ironing Board with Iron Rest, Aqua Blue/White. 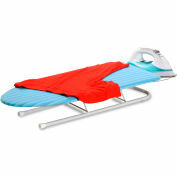 This colorful tabletop ironing board is a great space-saving laundry tool. 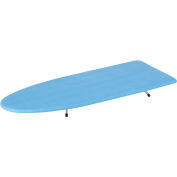 Compact in size, it's a great choice for small homes, apartments, dorm rooms, or the office. 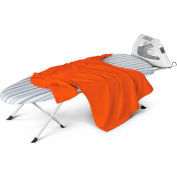 When set-up, this portable board provides a sturdy, ample ironing surface and incorporates a metal iron rest to prevent scorching. 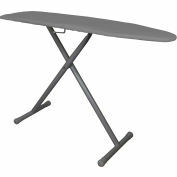 To store, just fold the legs and iron rest in for a slim, flat board that easily fits in a closet, under the bed, or in the car. Pad and vibrant aqua blue cover included. Wood and cloth construction.